Much of preparing for birth and the postnatal period revolves around mother and baby. Certainly for good reason: both work incredibly hard and both deserve those amazing moments in the first hour after birth. However, more research continues to surface about the importance of dad’s role during birth and the postnatal period. In fact, even beyond the immediate postnatal period, we’ve recently learned that dad’s interactions can impact a child’s social and emotional health for the first 10 years, but likely much longer. You can read more about dad’s role in child development in BellyBelly’s article Dad’s Mood Plays A Key Role In Child Development. Dr. Nils Bergman recently presented at the Academy of Breastfeeding Medicine and shared current research about the importance of skin to skin. What he shared which isn’t as commonly discussed is how important skin to skin time is for dad because it actually rewires dad’s brain. Skin to skin time is often suggested as an optimal activity to give your baby a better start. However, research now shows that we shouldn’t look at skin to skin as something to do to boost our baby’s start but rather look at it as the biological norm that it is. Because skin to skin between mother and baby immediately after birth is the biological norm, we now know that interrupting immediate skin to skin actually has risks. But how does this relate to dad? Dr. Nils Bergman recently presented research that shows just 30 minutes of skin to skin with dad actually rewires dad’s brain. Mothers have the advantage of the natural hormonal changes during and immediately following birth, especially the hormone oxytocin, to help their maternal instincts kick in. For dad, time spent with and caring for baby helps the bonding process. But skin to skin actually rewires his brain. How Does Skin To Skin Rewire Dad’s Brain? Many of our bodily processes are run by and impacted by our hormones. Our hormones are influenced by many things including our environment and actions. When dad spends time skin to skin with his newborn hormonal changes occur including a rise in dopamine. Dopamine is responsible for many things including pleasure. A rise in dopamine plus the release of oxytocin means dad’s brain creates a positive association with close interaction with baby. It seems that skin to skin with dad can help dad’s natural parenting instincts to kick in. 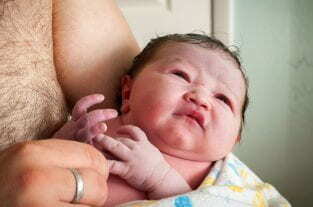 Certainly many dads have gone without skin to skin contact and been excellent, hands on parents. It isn’t something that if skipped will mean a poor parental bond. However, it does seem that research shows this natural rewiring can be an important part in early parenting. Perhaps it’s something to do with a biological positive association with baby. When it’s 2 am and baby is crying…again…that positive association could mean coping just a bit better. When baby is fussing with her mama, it could mean stepping in without request to offer a hand. It might mean being just a bit more confident in being more hands on. Or opting to wear or hold baby rather than swaddling and putting in the swing for extended periods of time (baby gear isn’t inherently bad, but they can be overused). While what happens on the first day or so of life isn’t the end all be all of parental success, it can and does play a role in baby’s development as well as parental child bonds. We often hear about the importance of skin to skin between mother and baby as it helps prevent postnatal haemorrhage, aides in beginning lactation, and helps stabilise baby’s breathing and temperature. We don’t always hear about the importance of skin to skin with dad. Baby benefits from any close contact, but it seems in this situation, dad also has a lot to gain biologically from skin to skin. By encouraging this contact on the first day of life, we can help dads begin parenthood in a positive way. Rewiring the brain to seek close contact with baby can mean an easier transition not only for dad but also for baby and mother.